Hello Deer 3 tier Diaper Cake makes a unique, pretty, and useful baby gift. Every baby needs diapers. Make it fun with a deer themed diaper cake. It would make a nice centerpiece for the baby shower. 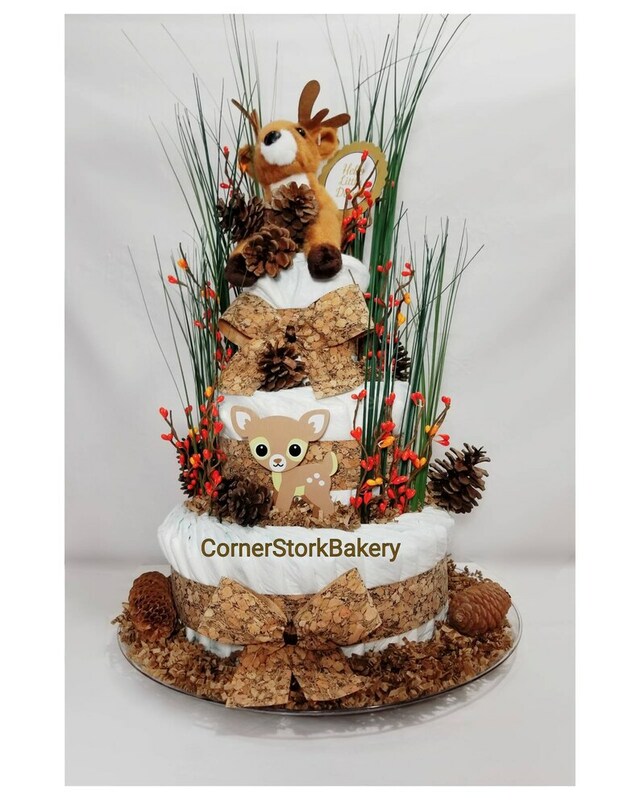 Especially, for a woodland animals, nature, or hunting baby shower theme. A theme that's perfect for the end of summer and through autumn. *All nicely wrapped in a cellophane bag with matching ribbon & a handmade gift tag. Custom orders are welcome. Colors can be changed to match the baby shower, or pink or blue for the baby's gender. I'd be happy to help. Looking for matching Mini Diaper Cakes for the guest tables? Send me a message and we can get your custom order started. Looking for a hunting themed diaper cake? I would be happy to help. Send me a message.